Sri Ponnada, an Indian American engineer at Microsoft’s headquarters in Redmond, Washington is on the verge of self-deportation. As her H4 dependent status has expired, she is confronted with the possible predicament of leaving the United States for India in 6 months. 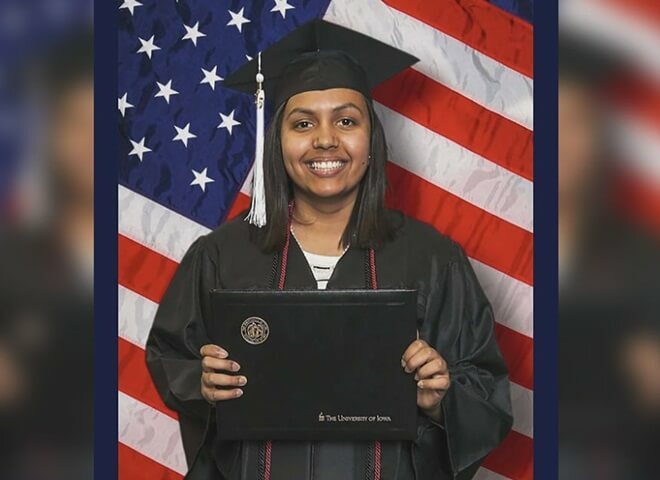 While her parents call the US their home, Sri Ponnada has been living in America since the age of 14. Born in India, she came legally to the United States along with her physician mother in 2008. She is one of the approximately 200,000 Indian American children among the ‘DALCA kids’ (Deferred Action for Legal Childhood Arrivals), who were legally brought to the US by their parents on H1B visa or other work visas. Microsoft engineer Sri Ponnada’s mother named Vara Ponnada came to the United States in order to pursue a residency program in internal medicine at St. John’s Episcopal Hospital in New York. On completion of the program, she joined the research team in Mayo Clinic’s cardiology department in Rochester, Minnesota. Then, she was employed with the Hancock County Health System in Northern Iowa. While working in Iowa, Vara Ponnada received a national interest waiver for her medical competencies and accomplishments, which allowed her and her dependent children to stay in the USA. She has applied for legal permanent residency in the US, but she is at the mercy of the US Congress like lakhs of Indian Americans in the green card logjam. Only 7 % of green cards issued in a given year are allotted to the green card applicants of Indian origin with approved I-140s. Given the country-cap-wise issuance of green cards, it will take Indian immigrants 151 years to get legal permanent residency, according to a recent study by Cato Institute, a libertarian think tank in the US. Sri Ponnada had got an F-1 visa which is given to foreign nationals who are eligible for studying in the United States. She grabbed the opportunity to work at Microsoft’s headquarters in Redmond under a 18-month STEM-OPT status. She may have to deport herself from the US once her STEM-OPT status expires in February 2019. She applied for an H1B visa this year, but luck did not favor her in the lottery. An alumnus of Iowa University, she loves volunteering for humanitarian causes. She used to tutor students in computer science and coding at a local public library in her university days. She was at the helm of seeking employment opportunities from tech companies for Iowa students while serving as the president of the Women in Informatics and Computer Science Club in Iowa. She also volunteered at the Women’s Resource and Action Center in Seattle. Travel Beats is an Indian Community Portal by Indian Eagle, a leading travel booking partner of Indians in USA. Subscribe to Travel Beats’ free newsletter for the latest US immigration and visa news, Indian community news, inspiring stories and international travel updates. Nothing to pity here, everything to be happy about. She gained a good education, good employment, made a lot of money, awesome experience in the US. She will be celebrated in India for her skills. However, she is not a US Citizen and all her legal avenues are exhausted because of the current system and of course luck. But that does entitle her or anyone here for any number of years to become citizens or permanent residents. Just because she never lived in India does not make her non-Indian. Definitely there will be a huge adjustment period if she has to go back. But that’s a bad excuse, right? Also , this article is misleading with the title. This is not self-deportation, this is simply moving back to the home country because of Visa getting expired. If this is called self-deportation, then everyone in tourist visa is also getting self-deported from every country they are visiting when they go back. Oh, really? then talk about the FAIR system which great president introduced, of course America needs only talent. America can’t provide option for the talent what is the point of talking all these immigration logic here?. You can’t control border and crime and you can only screw up the legally tax paid people who are living in visa for the sake of next elections and for your votes? It is a kind of self deportation since you were sent back with no choice left. Coming to going back to India. Not sure you had kids who grew up in USA and studied but definitely there are lot of cultural and ethical satisfactions these kids had to do when they move back. It is easy to talk if we are in a safe boat and talking about the rules and regulations. But unfortunately people ignore what they screwed up when they are in the same boat. Ask your congressman to work on this as only congress has jurisdiction not the President – they work on neither the illegal tide over the border or the fleet of talent of people trained here . No Taxation without Representation came from American revolution. Now, USA is showing double standards by taxing non-immigrant visa categories and at the same time not giving any option for representation ( read Citizenship). America has every right to decide its own immigration policy. It is too bad that she could not stay in the USA, but, that is life. If America wants, it can stop issuing green cards right now. If India wants, India can stop issuing visas to any foreign citizen right now. No one has any right complaint on a country’s internal matters. She should go and live and work in Jamaica. It’s only 3 hours from America if uou live in the northeast. She can get citizenship there and then travel back to America. If your country iof origin can not take care of you .why should any other country will take care or give citizenship. It is a shame on the country you are born. Corrupted country like India can not take care their own citizens. It is a shame on priminister ,as well as the politicians .Why do they come to power if they cannot take care of their people.They are only there to screw up citizens. Why ordinary citizens have to go to other country for proper living .Indian public should know if the minister can not fullfill their requirements they should be chucked out from their seat. After all the politicians are there for the public. The public should be allowed to ask questions why the living conditions is so poor for ordinary public in India . Ministers should leave the position if he or she cannot give the education ,infrastructure ,medical care,water,food and garbage free country. Stupid Indira. Your statement is total nonsense, that is not what the article says. why do you say “Corrupted country like India can not take care their own citizens.” India welcomes these Citizens back. Duh! Not knowing exactly why her H4 dependent status has expired, my guess it she is now over 21 years old, she should look into US EB-5 Program offered by the US government. I encourage her to talk to an Immigration Lawyer and find a way to invest money through her parents to create 10 US jobs, that would entitle her for a ‘conditional Green Card’ and finally a Permanent one. Good Luck!!! Shame on you Indira. Who said India is not welcoming them? Who said india does not take of them? Talking of corruption where are you living? In the moon? Do you watch the American television? If not please do so. Believe me. The present America does not like lightish brown,medium brown or dark brown people and for that matter any shade of brown or black.. I do not know to which category you belong. You are living here as an unwanted person.Ha Ha. Change your mind Indira and have a positive outlook. Yes. Politicians everywhere are corrupt. You do not have to go anywhere. Instead of fuming, go to India and do something positive. Little drops of water make a mighty ocean.